This circuit sends morse code messages that are stored in an EPROM chip. The keyer can output either a one-shot message such as “CQ DX DE XXXX” if the start button is pushed, or it can run continuously by switching the free run switch on. 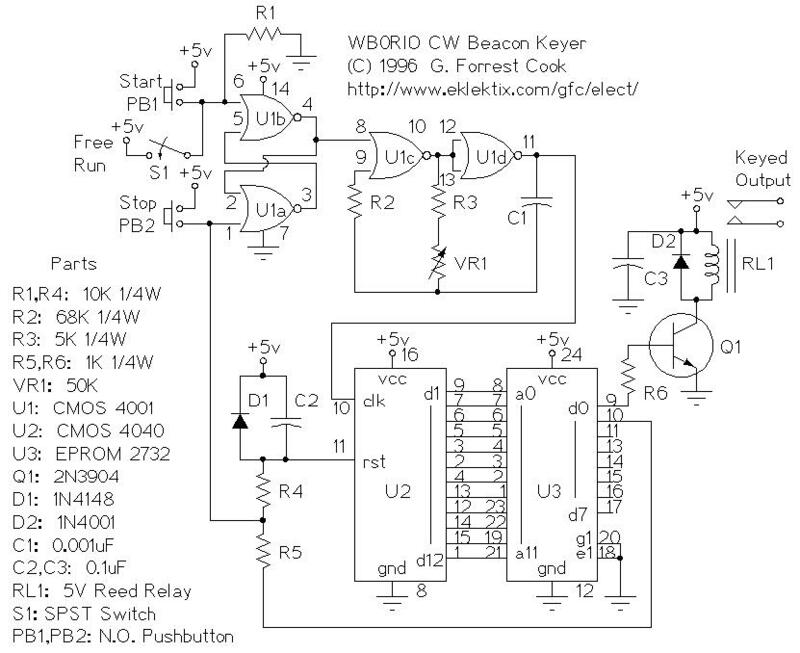 The continuous mode is useful for making low power (QRP) beacons. Pressing the stop button interrupts the message. EPROMs other than the 2732 can be used if suitable changes are made to the circuit. For larger EPROMs, just ground the higher order address input lines on the EPROM chip, and wire the appropriate chip select pins for outputs enabled and chip selected. I have written a C language program called cw2hex that can be used to convert a sequence of characters into in image that can be burned onto an EPROM chip for use in this circuit. The program produces an Intel Hex format file. The hex file should be readable by most modern EPROM programmers. The C source code and Unix Makefile are in the file cw2hex.tar.gz (tar.gzip). A DOS executable version of the code is available as cw2hex.exe. It should be possible to compile cw2hex.c on any machine with a C compiler although it will probably cost less to do so on a machine running Linux (plug). The C program source files are available if you want to look at the code from your web browser.